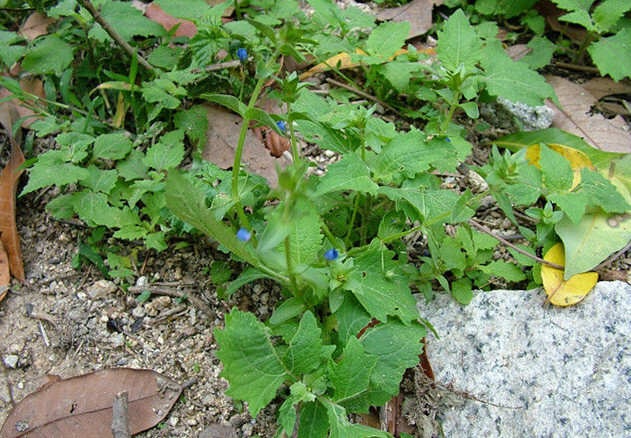 The drug is the dried or fresh entire herb of Anagallis arvensis L. (family Primulaceae), grow-ing in fields, wast lands, and distributed in Zhejiang, Fujian, Taiwan, Guangdong of China. The root contains triterpenoid saponins. The sapogenin is anagallin .The stem and leaf contain anagalligenone and also contain flavonoids and caffeic acid, ferulic acid. It is used to dispel wind-cold and remove obstruction from collateral channels, remove toxicity; for the treatment of snake bites, lyssodexis, carbuncle, arthroncus of knee joints. Decoct 9~15 g or 15~30 g of the fresh, or pounded into juice for oral taking. Proper dosage is for external application, pounded for applying with the fresh.